Known as an early invader of old fields, Cherry (Prunus serotina) is often found here in middle Tennessee in the moist creek bottoms and well-drained hollows where a century ago stood small cabins with subsistence farmers. There they made a living from a few acres of row crops for cash money and a small pasture of hogs and cattle for food. World War II and industrialization came, and the descendants of those farmers moved into the cities and county seats for a better way of life. Their farms returned to forest, and cherry grew from their fields with its bright-red heartwood and small rim of white sapwood. These trees are now old enough to harvest and become flooring and moulding at Carroll Hardwood. While these floors in no sense “wear out”, they tend to accumulate marks from traffic from high heels, furniture removal, and other heavy usage. Please note as well that Cherry is photosensitive and will darken from a light red to a deep cherry with exposure to light over time. Please download our retail catalogue from the tab below for our most up-to-date prices and grade descriptions. Characterized by a predominantly red floor of relatively uniform color, this grade is intended for more formal settings. Knots, bird peck, and rustic characteristics are excluded. The grade will admit up to five percent white sapwood in the floor, of which a flash will be seen here and there. Small black streaks 1/8” in width and one to three inches in length also appear occasionally. 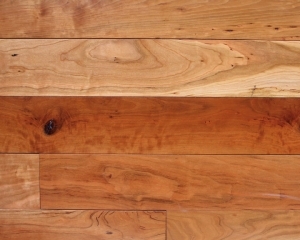 Select Cherry is available from Carroll Hardwood in a Natural finish. With its sound, tight knots, white or grey sapwood, small gum pockets, bird peck and wormhole, Cherry makes an attractive rustic floor with a true country appearance. 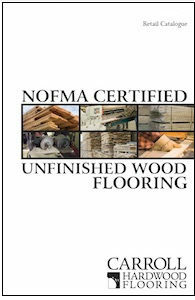 While still mainly a red heartwood, there is more color variation with some pieces having a very dark red color and others having black or grey streaks, as well as more white sapwood in the floor. 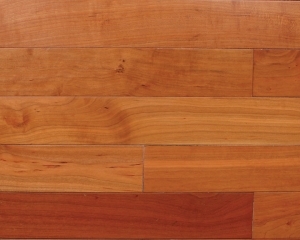 Character Cherry is available in a Natural finish.